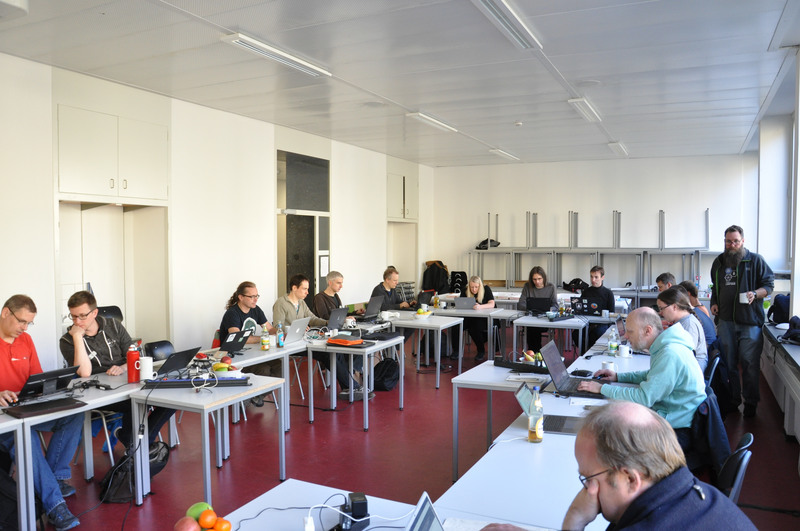 Seit 2012 veranstalten wir zweimal bis dreimal im Jahr ein OpenStreetMap-Hackweekend in unseren Büroräumen. Es wird am Freitag mit einem gemütlichen Abend in der Kneipe eingeleitet. Im Laufe des Abends trudeln die meisten Gäste ein. Viele haben eine weite Anreise hinter sich. Sie kommen aus allen Teilen Deutschlands, und oft ist auch der ein oder andere Gast aus dem Ausland dabei. Von Samstag früh bis Sonntag abend geht es dann zur Sache. Es wird diskutiert, manchmal auch Flipcharts und Whiteboards vollgeschrieben. Dann wieder ist alles still, weil alle auf ihre Arbeit am Notebook konzentriert sind. Dazwischen unterbrechen wir unsere Gäste mit Pizza, Keksen, Gummibärchen oder Kaffee. Auch den Samstag Abend verbringen wir gemeinsam im Restaurant. Aufgrund der Routine, die sich im Lauf der Jahre eingestellt hat, mussten wir dieser Veranstaltung zuletzt nur noch sehr wenig Aufmerksamkeit in der Vor- und Nachbereitung schenken. Die Wiki-Seite ist in zwei Minuten aufgesetzt (Copy und Paste vom letzten Jahr, die Termine werden angeglichen, die alten Teilnehmernamen werden quasi nur pro forma herausgelöscht). Wir recyclen sogar den alten Einkaufszettel. Doch unser 16. Hackweekend stellte alles auf den Kopf. Ein zu Martin Raifer leicht dahingesagtes “wir können uns ja auf dem nächsten Hackweekend darüber unterhalten” verursachte ein 9-köpfiges Vorbereitungstreffen für die SotM in Heidelberg im nächsten Jahr. Und meine Bemühungen, den Austausch mit den Franzosen zu intensivieren, hatte Früchte getragen. Vincent Privat (aus Toulouse) machte Werbung auf der JOSM-dev-Liste. Sieben JOSM-Entwickler aus ganz Europa (von Österreich, über Polen und Belgien bis Frankreich) meldeten sich an. Plötzlich war klar, dass die angemeldeten 32 Gäste überhaupt nicht in unser Büro passen würden. Glücklicherweise hat uns Prof. Dr. Günther-Dieringer ganz kurzfristig und unkompliziert einen Raum in der Hochschule Karlsruhe (University of Applied Sciences) vermittelt. Hierfür danken wir ihm alle ganz herzlich. Am Ende war das Hackweekend wieder ein großer Erfolg. Auch diejenigen unter den Besuchern, die befürchtet hatten, dass alles nicht mehr so schön gemütlich sein würde, waren am Ende zufrieden. Der Karlsruher und Heidelberger Teil der SotM-Working-Group haben viele Fragen geklärt, den Zeitplan für das nächste Jahr aufgestellt und das Konferenzformat festgelegt. Ein Protokoll wird demnächst auf den Wiki-Seiten der OSMF zu finden sein. Auch die JOSM-Entwickler, die sich teilweise noch nie getroffen hatten, waren sichtlich produktiv und haben endlos Blätter auf dem Flipchart vollgeschrieben. 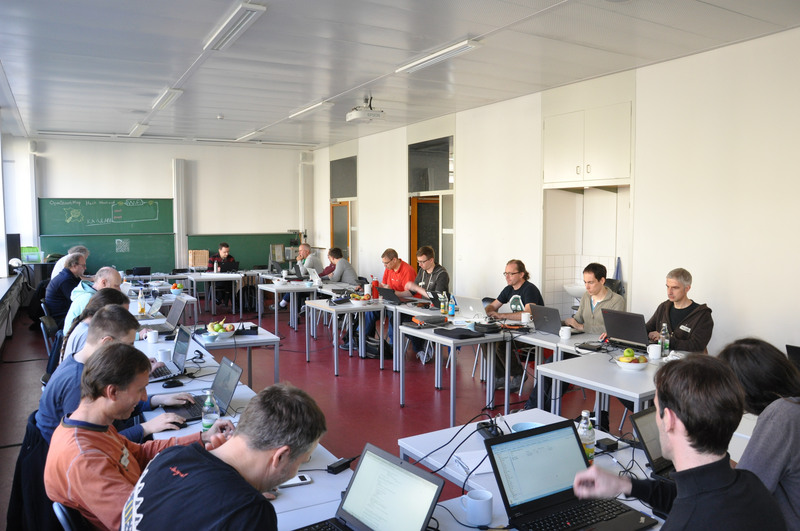 Wir freuen uns schon auf das nächste Hackweekend im Februar 2019! As mentioned two months ago, we have made some changes to our download server at download.geofabrik.de. The publicly available files now don’t contain user or changeset information any longer (see below for details). You can still get everything that was there before, but files that do contain user information were moved to a server that requires you to have an OSM login. The public server continues to be download.geofabrik.de, and the URLs and paths have been unchanged. The new server that requires a login is called osm-internal.download.geofabrik.de, and while it looks largely the same as the public server, the files it offers will have a name component of -internal in order not to confuse them with the public files. The change was originally made on 03 May. Unfortunately osmosis and older versions of osmium, and all programs depending on them (e.g. osm2pgsql < 0.96.0) don’t work with PBF files lacking metadata fields. They fail to read PBF files which don’t have any username, user and changeset field set. To work around that, starting 05 May, we’re now writing empty strings to all user fields and zeros to all user and uid fields. OSM extracs and diffs with full metadata are still available but you have to log in with your OSM account. For security reasons, it is not enough to pick the cookie out of the developer console of your web browser. The cookie will become invalid after 48 hours and the server will redirect you to authorization form of openstreetmap.org if you send that cookie after it has expired. That’s why you have to retrieve a new cookie every 48 hours or any other time the server forces you to do so. We have published a client program written in Python (read the documentation) automating the cookie retrieval. The repository containing the client also contains the server software if you are curious or want to use it on your own server providing sensitive data. This blog post may be updated as things develop. The general functioning of the server and all URLs will remain unchanged. We believe that the majority of users of our download server, who use the extracts to populate rendering, routing, or geocoding engines, will not be affected by the changes. At the same time, we will introduce a new service, osm-internal.download.geofabrik.de, which will be like the “old” download service, offering full history files, regional extracts, and diffs with full user information and un-diluted time stamps. This service will be 100% free of charge like the main download server, but will require an OAuth login with the openstreetmap.org web site and might* also require a click-through user agreement in order to safeguard personal data. *) Some details are still being worked out. 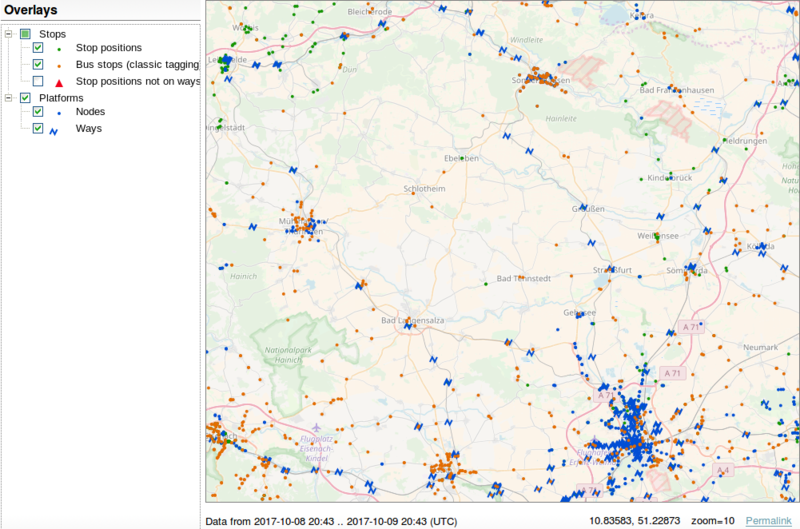 We recently rewrote the Public Transport views of our OSM Inspector. The old views had been used rarely and were of limited use, so we went for a full rewrite. While the old views aimed to give an overview on both the infrastructure and the network, the new views are focussed on the routes and stops. The public transport schema used today was proposed back in 2010/2011 but it was adopted rather slowly. Also, many mappers made lots of mistakes when trying to use the schema because the documentation on the wiki was confusing. To clearly distinguish public transport mapping that follows this schema from old-style public transport mapping, new schema is now called “public transport v2” – even though there really wasn’t ever a version 1. 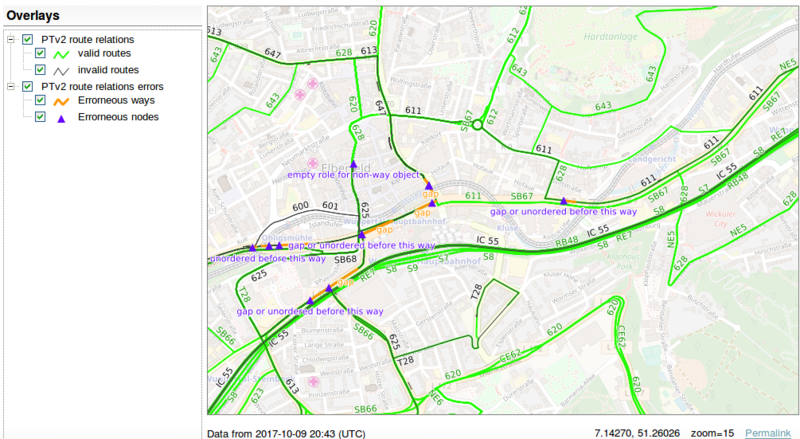 The new views of OSM Inspector try to support good mapping according to the “public transport v2” scheme, and act as a validator. The Stops view shows stop positions and platforms (multipolygons are not supported yet). Go to an area you are familiar with and check if there are missing bus stops. Use this view on zoom levels 10 and 11 to spot (rural) areas where no bus stops are mapped at all. Just take your car or bicycle and visit them! Platforms are rendered in blue, stop positions in green. Bus stops with highway=bus_stop but without a public_transport=* tag are rendered in orange. They are not errors if they are the only object that represent a bus stop (per direction). The Routes view shows route relations which claim to be v2 route relations (they have the tag public_transport:version=2). The view shows whether a route is valid (green) or not (black) and highlights objects which are either the reason of invalidity or which are located next to the invalidity (orange and purple). When is a route valid? The order of the members of the route is important. The list of members is not an unordered collection. One route relation represents only one variant of a line. Therefore, you need at least two route relations for most lines, one for the forward direction and one for the backward direction. The first member is the first stop of the route (where it starts). It either uses the role stop or stop_entry_only. The second member is the second stop of the route and so on. If a stop is mapped by both a stop position and a platform, add both to the relation but the stop first and immediately followed by the platform. 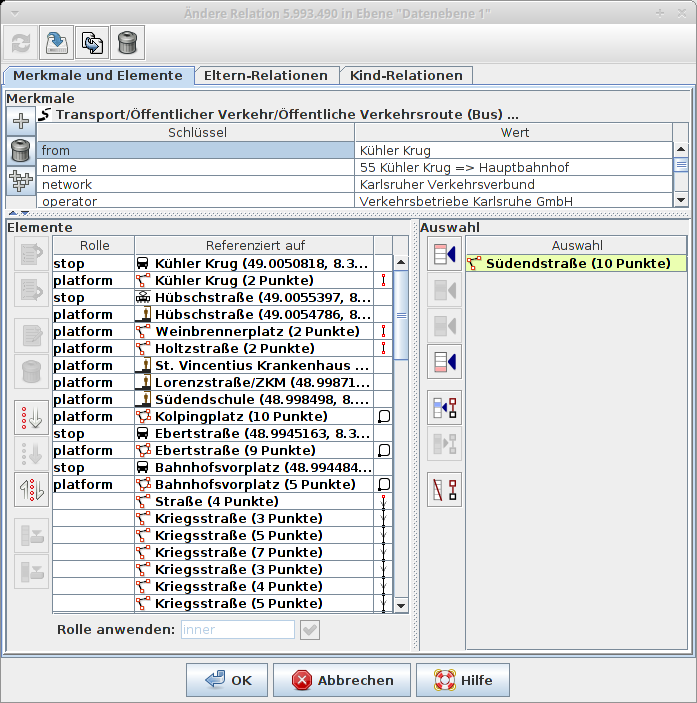 Platforms use the roles platform, platform_entry_only or platform_exit_only. The list of the ways the vehicle uses is at the end of the relation member list (i.e. after the last stop). These ways use an empty role. What does OSMI currently check? A route must have stops or platforms. A route must have members which are neither stops nor platforms. Member nodes must have one of the following roles: stop, stop_entry_only, stop_exit_only, platform, platform_entry_only, platform_exit_only. Member ways must have one of the following roles: stop, stop_entry_only, stop_exit_only, platform, platform_entry_only, platform_exit_only or an empty role. Member relations must have one of the following roles: platform, platform_entry_only, platform_exit_only. The member list must begin with the list of stops and platforms. There must not be any member with a non-empty role after the first member with an empty role. Train, tram and subway routes must use railway tracks. Buses and trolleybuses must use roads. Trolleybuses need trolley_wire=yes (or trolley_wire:forward/backward=yes). Roads/tracks under construction trigger errors. The route=* tag of a route relation must have one of the following values: train, tram, subway, bus, trolleybus, ferry, aerialway. 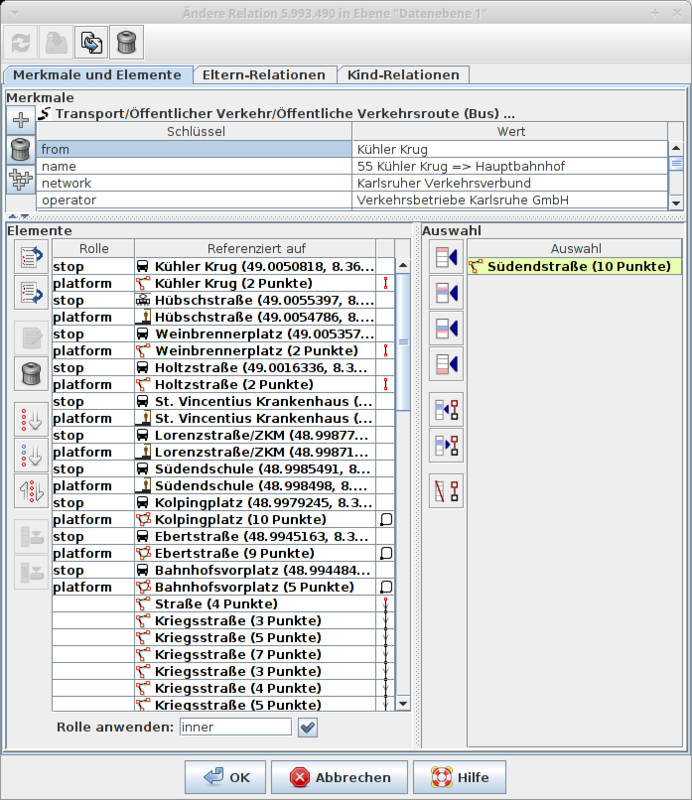 Correct order of stops and platforms is not checked. It is not checked if all stop positions of a route are located on a member way with an empty role. There is no test which checks if platforms are located next to the route/stop position. Access tags of member ways are not checked. If a platform is followed by another platform, users who follow the schema exactly will read two stations. If both platforms share some nodes, it is very likely an error. osmi_pubtrans3 is free software, and patches are welcome. 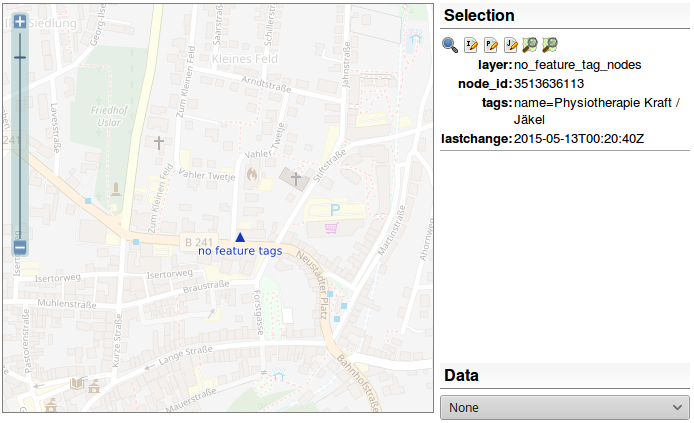 The Tagging view of our OpenStreetMap Inspector tool got two new checks (represented as layers) a few days ago. Both look for oddities in OSM data. 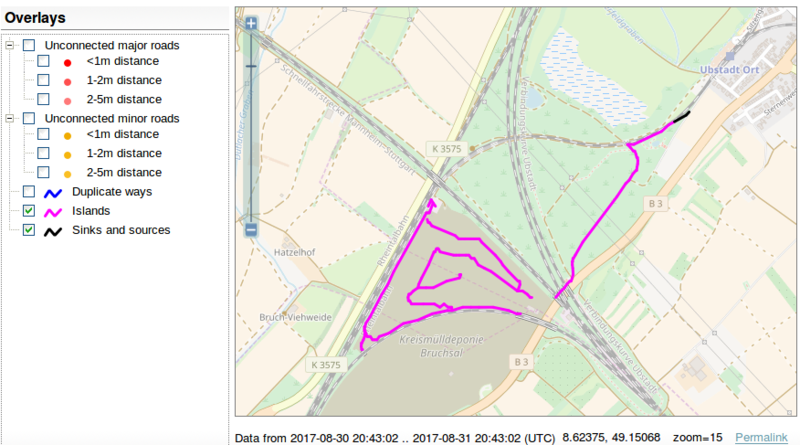 The freedom of OpenStreetMap to tag what you want can lead to tagging errors. One common but maybe dangerous error is the usage of tags like disused=yes, abandoned=yes, construction=yes and proposed=yes on objects. For example, if a mapper wants to map a road which is under construction, they usually tag highway=construction + construction=secondary/tertiary/<whatever>. This is a good way of tagging because data consumers who look for roads and who are not interested in roads under construction can just look at the value of the highway=* key and check if its value is in a defined set of “good” values (primary, secondary, tertiary, …). Unfortunately, some mappers tend(ed) to use highway=secondary/tertiary/<whatever> + construction=yes in this case. This tagging is misleading. Data users have to check if an object is marked as being under construction. Because a minor key  such as disused=* inverts another tag, we call this tagging style “misleading”. 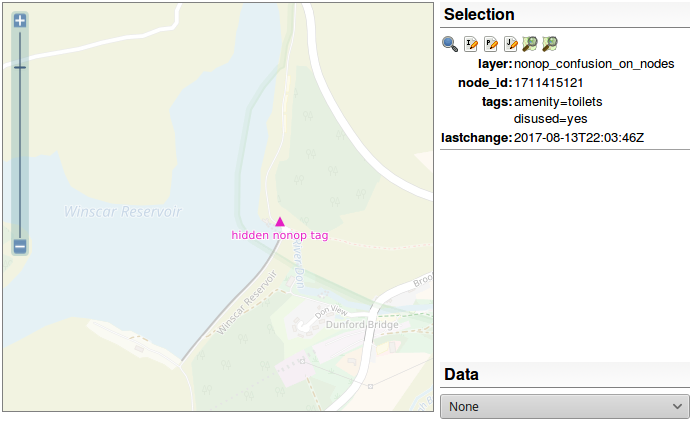 OSM should be easy to use and that’s why the tagging of these objects should be improved. If the value of a main key is disused, abandoned, razed, dismantled, proposed or construction, it is ignored, further checks are skipped, and the object is not reported as errorenous. Inverting keys with a value of no are ignored because they do not invert the meaning of the main key. As a side effect, objects with mixed tagging like highway=primary + construction=primary are reported as errors, too. They occur if a mapper changed the object from highway=construction to highway=primary but forgot to remove construction=primary. It is an indicator that these objects might be worth checking. It occurs rather often that newbies add objects to OSM without proper tags. They manage to add a name, a description and/or a website but that’s it. This is caused by both a lack of experience and a suboptimal user interface of the editor being used (and in rare cases a lack of suitable tags). These objects are more or less hidden from any data consumer because nobody wants to parse the value of a name or description tag to guess what it represents. The processing software distinguishes between non-feature keys and feature keys. The office tag is only a feature tag if it has a value other than yes. All other keys are considered being neutral and do not influence the evaluation. If an object has a non-feature key but no feature key it is flagged as an error. If the object has a description tag and the description contains either non-factual information “the best bakery in A-Town, founded by James Smith in 1786”, it might be some kind of search engine optimization. Remove all non-factual information (it might be justified to delete the description completely). If the object has a website tag, check if the website still exists. We don’t need closed shops. Check if the object is located properly. If it is obviously wrong (e.g. center of the road) or on top of an existing object, it might have been be uploaded automatically. Is the user a newbie and joined OSM recently? If yes, write a friendly welcome message. If it is more than a month ago and they is not active any more, use your time for more useful tasks. If you help fixing these errors, you will have to do a lot of research for tags. Consider this a valuable experience – you will learn lots of tags you did not know and you will learn what could be mapped or is mapped at OSM. Due to changes in OSRM we had to set up our own process which looks for routing errors. We now use Open Source Routing Machine’s “small components” extractor but with the default car profile. Don’t be frightened. There are lots of new errors because our validation is now strict and flags everything which is unreachable using the default car profile most OSRM users probably use. The OSM data model itself does not differentiate between major and minor, more or less important keys. But the usage of tags which has established since 2004 does and there are tags like amenity=shelter which are further distinguished by using shelter_type=*.